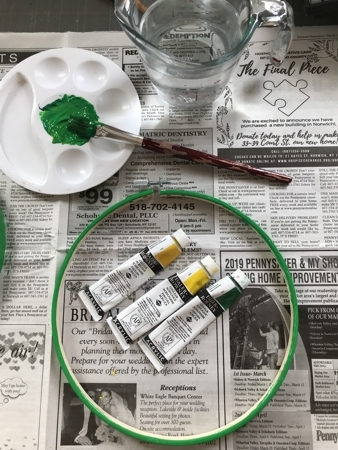 This very easy Spring-themed project makes a gift for housewarming parties, weddings and so on. 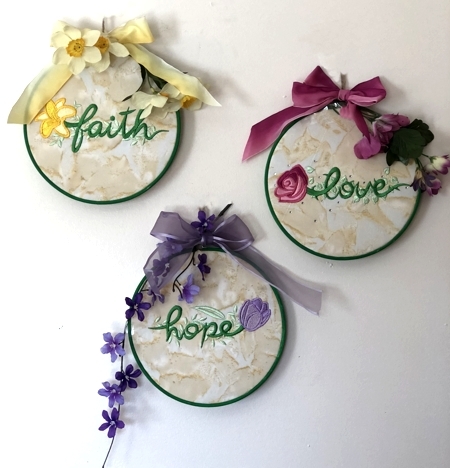 We used the designs from the Faith-Hope-Love Floral Set. 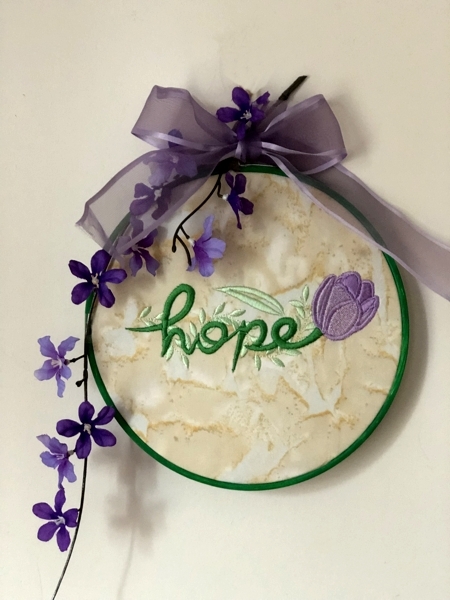 All designs are for the large (5" x 7") hoop. all kinds of embellishments to your taste (we used silk flowers, wired ribbons and some rhinestones). 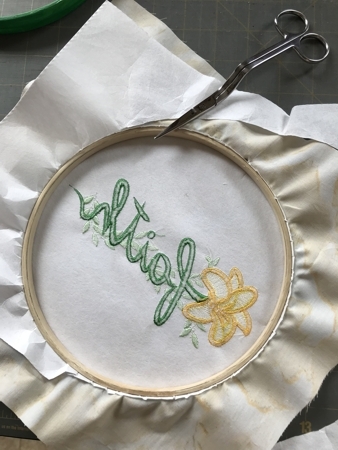 Stabilize the fabric for embroidery with medium-weight cut-away stabilizer. Hoop it tightly. 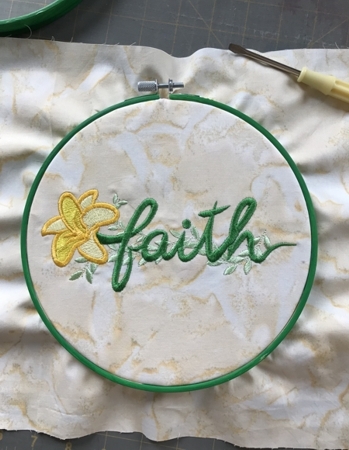 Upload the files from the Faith-Hope-Love Floral Set into the machine and embroider them one by one. Press the stitch-outs. Do not remove the stabilizer! 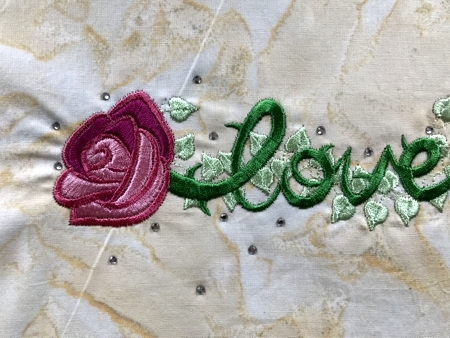 If you want to decorate the stitch-outs with rhinestones, do it at this stage.We attached a few hot-fix crystals to imitate dew drops on the flowers. Now set the stitch-outs aside for the time being. 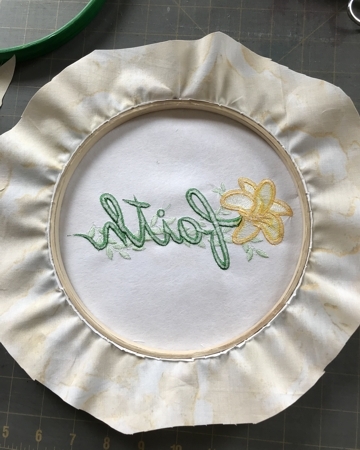 While the machine is doing the embroidery, you can paint the hoops. 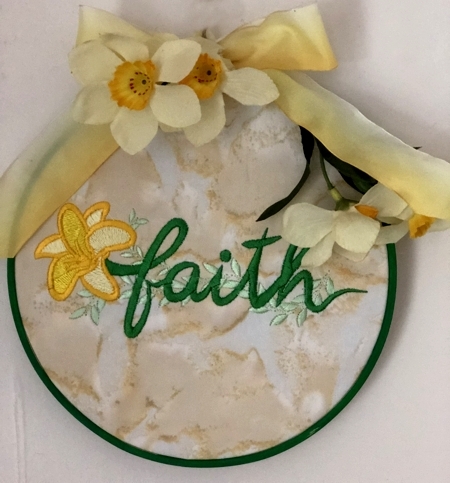 While you are waiting the hoops to dry, lay the craf felt on a table. Take the inner circle of the hoops and a graphite pencil. Trace the inside of the inner circle. Cut out along the trace line. You'll need 3 felt circles. 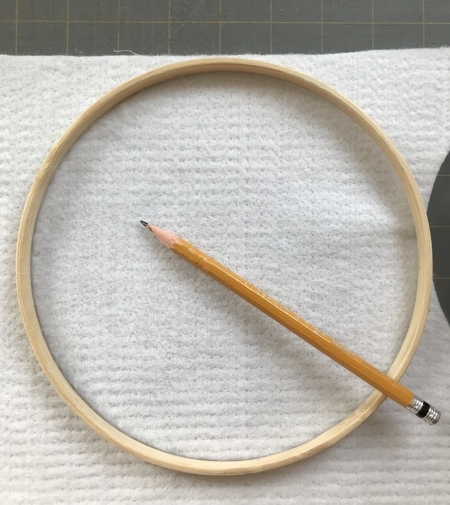 Now insert the stitch-out into the hoop. Stretch the fabric to avoid any creases and folds. Tighten the screw. Cut away the excess stabilizer. Take care not to cut the fabric. 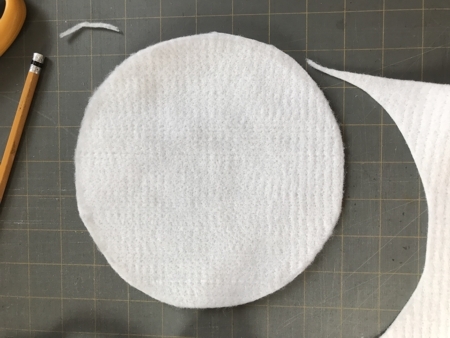 Then cut away the excess fabric, leaving margins about 1 1/2"- 2". 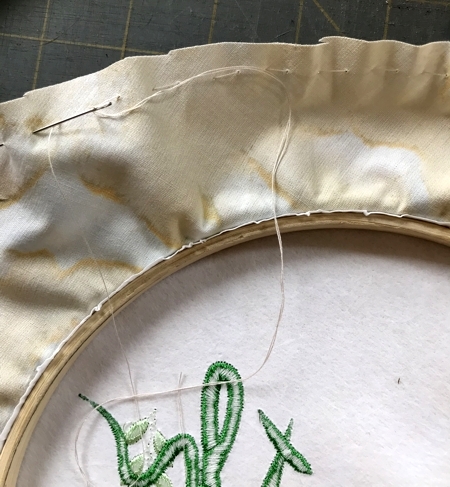 Thread the needle and baste along the outer edge. Pull the thread to gather the fabric. Tie the thread and cut. 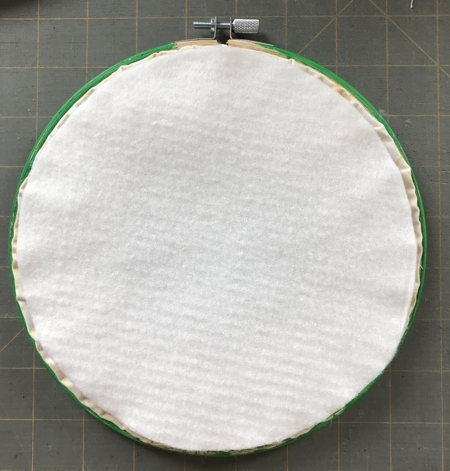 Cover the back with the felt circle. 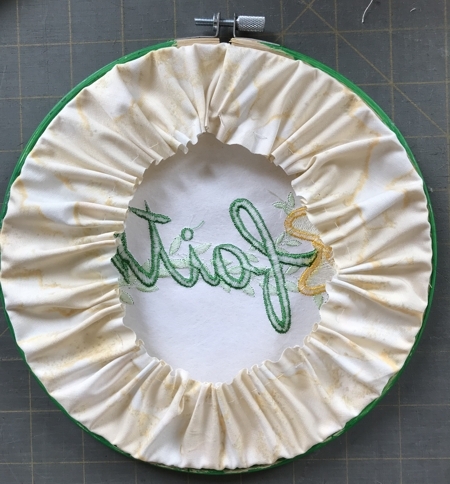 Sew the felt circle to the fabric along the outer edge of the felt. 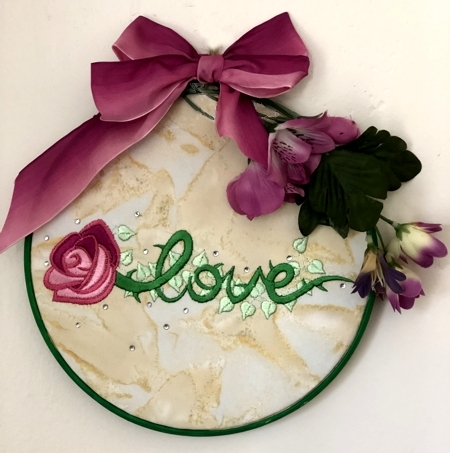 Decorate the hoops with silk flowers and/or ribbons.